This coated 60 lb. 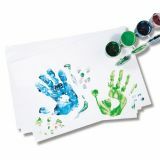 white sheet is an ideal paper to be used with finger paints. Its nonabsorbent surface provides for fast drying. Designed with little hands in mind. This coated 60 lb. 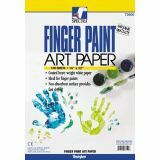 white sheet is an ideal paper to be used with finger paints. Its non-absorbent surface provides for fast drying. 100 sheets, 16" x 22".